Brown the ground beef in a skillet. Drain and set aside. Boil green beans for 15 minutes or until tender. Drain and set aside. In a large bowl, combine soup, water, hot sauce, salt, pepper and garlic powder. Mix well and set aside. Combine ground beef and green beans in a 9x9 baking dish. Pour soup mixture over the beans and beef. Cover dish with foil and bake in oven for 20 minutes. Remove baking dish from the oven and remove the foil. Place biscuits directly on top of the casserole - you should have room for 5-6 biscuits. Place dish back in the oven and bake uncovered for 15-20 minutes or until biscuits are done. Serve immediately. will still be slightly firm. Place beans in a serving bowl. In a small bowl whisk together red wine vinegar, rice wine vinegar, olive oil, stock, salt, pepper and garlic powder. Stir in dill, parsley and oregano. Pour dressing over the green beans and toss to coat. Place in refrigerator for 3 hours before serving. Heat 2 inches of oil in a skillet to 350 degrees. Wash green beans and remove the stems and fibers. Pat dry with a towel and set aside. In a small bowl, whisk together eggs, buttermilk and hot sauce. In a separate bowl, combine flour, salt, pepper and garlic powder. Mix thoroughly. Dip green beans in egg mixture. Shake off excess and then roll in flour mixture. Fry coated green beans in oil until golden brown. Drain on paper towels and serve immediately. Remove the stems and fibers from green beans. Leave whole and steam until tender, then drain and place in serving bowl. Cover with foil to keep the beans warm. Melt butter over medium heat in a saute pan. Saute almonds in the butter until lightly brown. Remove from heat and add lemon juice. Pour almond mixture over the green beans and toss to coat. Season with salt and pepper. Serve immediately. 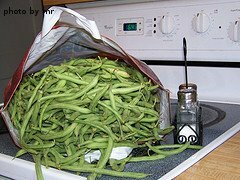 Boil green beans for 15 minutes or until tender. Drain and pat dry with a towel. Set aside. In a small bowl, whisk together vinegar, hot sauce, brown sugar, soy sauce and salt. Set aside. In a skillet, melt butter over medium heat. Add the onions and saute until translucent. Reduce heat to medium low. Add the sauce mixture to the onions and stir until sugar completely dissolves. Add the green beans to the saute pan and toss with onion mixture to coat. Cook over medium-low heat until everything is heated through. Pour green beans into a serving bowl and sprinkle bacon bits on top. Serve immediately. For more easy green bean recipes check out my good friend, Chef Deb, at www.chef-menus.com. You will find great tips on party menu planning, recipes and more!